ALC 69 lunes el 17 de mayo. 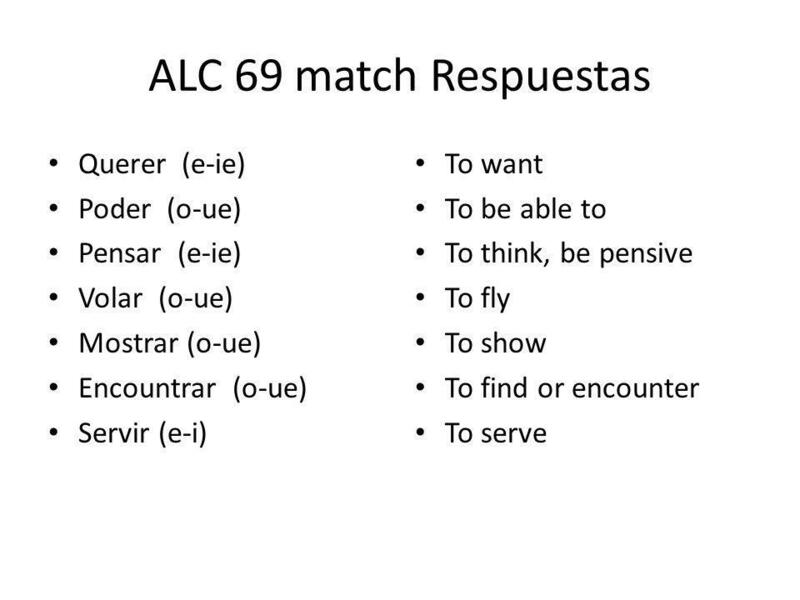 objetivo Aprender ALC 69 match Querer (e-ie) Poder (o-ue) Pensar (e-ie) Volar (o-ue) Mostrar (o-ue) Encountrar (o-ue) Servir. 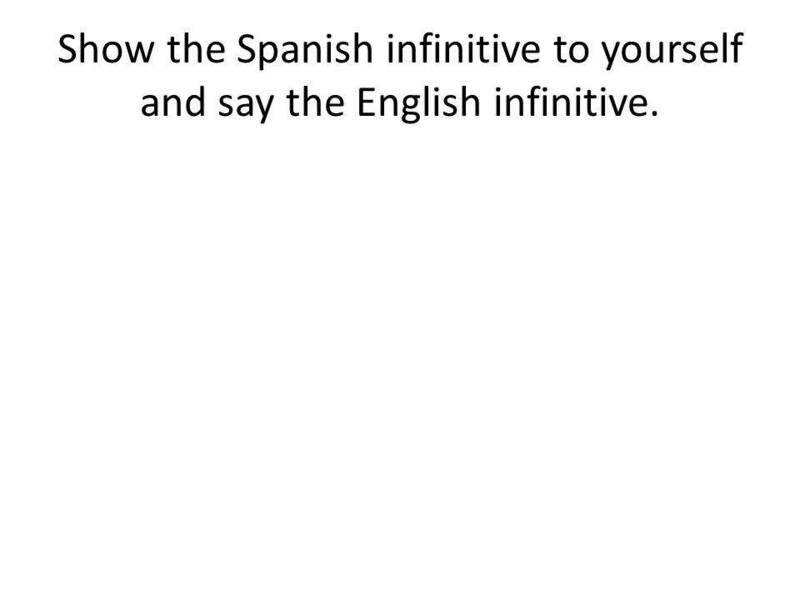 6 Show the Spanish infinitive to yourself and say the English infinitive. 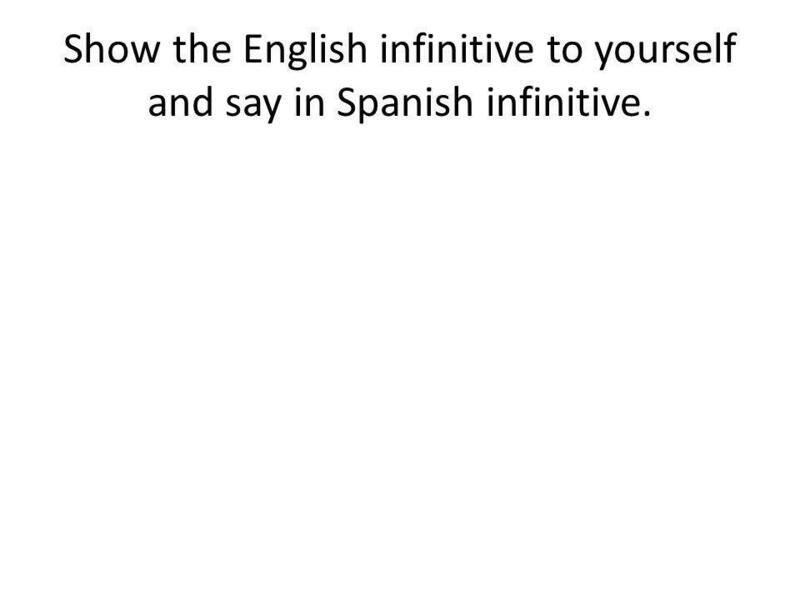 7 Show the English infinitive to yourself and say in Spanish infinitive. 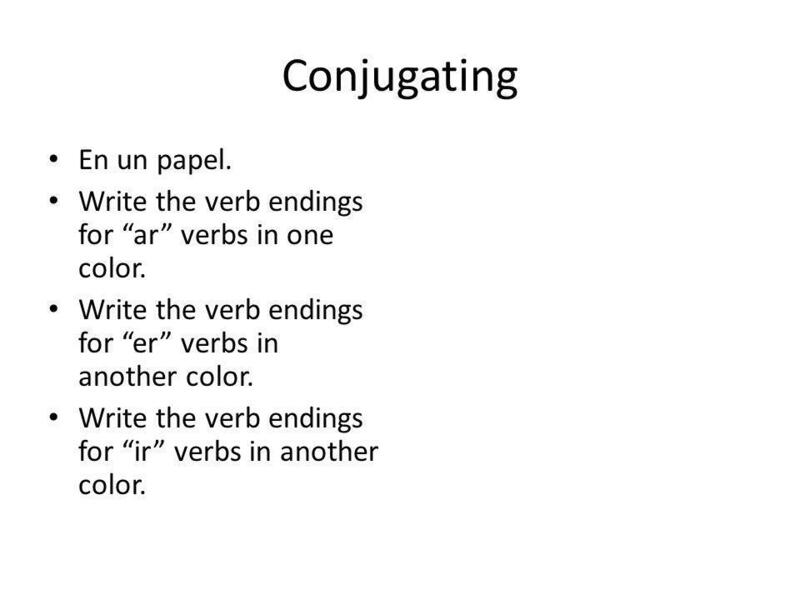 9 Conjugating En un papel. Write the verb endings for ar verbs in one color. Write the verb endings for er verbs in another color. 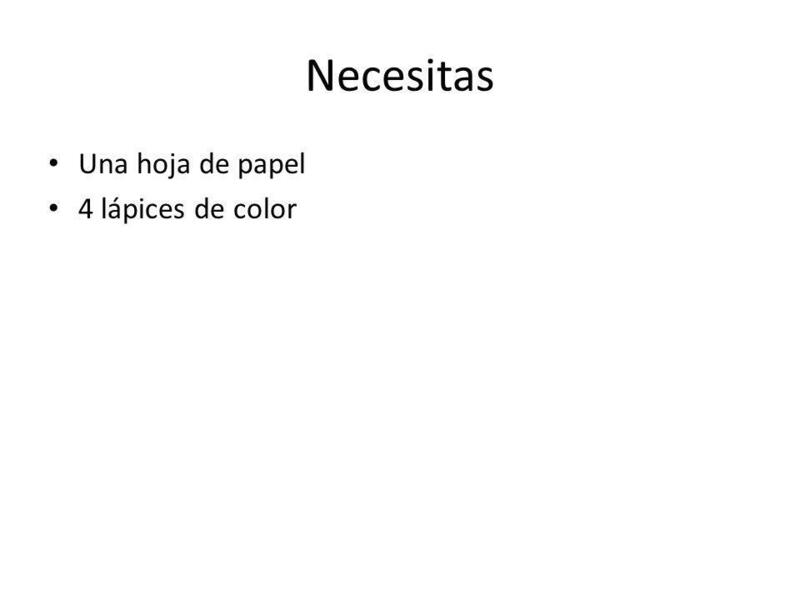 Write the verb endings for ir verbs in another color. Download ppt "ALC 69 lunes el 17 de mayo. 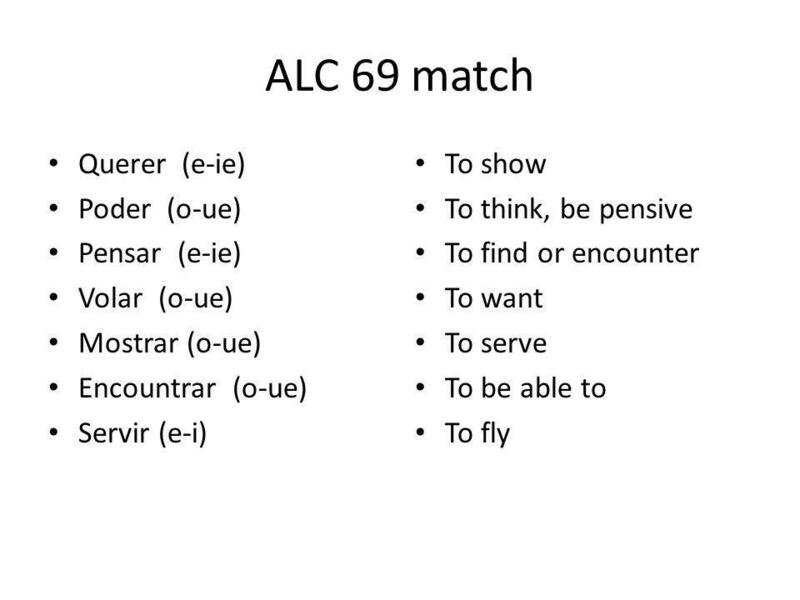 objetivo Aprender ALC 69 match Querer (e-ie) Poder (o-ue) Pensar (e-ie) Volar (o-ue) Mostrar (o-ue) Encountrar (o-ue) Servir." Infinitives P. 32 Realidades 1. Miércoles el 12 de mayo. objetivo I can create a 7 day weather forecast by illustrating the weather and telling what to wear and present it to the class. Irregular Verbs, Stem-Changing Verbs: e - ie, e - i, o - ue. In English you often use they, you, one, or people in an impersonal or an indefinite sense meaning people in general. In Spanish you use se. The Present Tense of Spanish Stem-Changing Verbs Remember: 1.There are three types of infinitives: -ar, -er, - ir 2.Infinitives in Spanish are made up. Spanish Stem-Changing Verbs e→ie o→ue u→ue. Los verbos que cambian e→ie 1. **Tener 2.Querer 3.Pensar 4.Empezar 5.Comenzar 6.Perder To have To want To think. Spanish Stem-Changing Verbs e→ie o→ue u→ue Stem-changing verbs give their stems the boot! 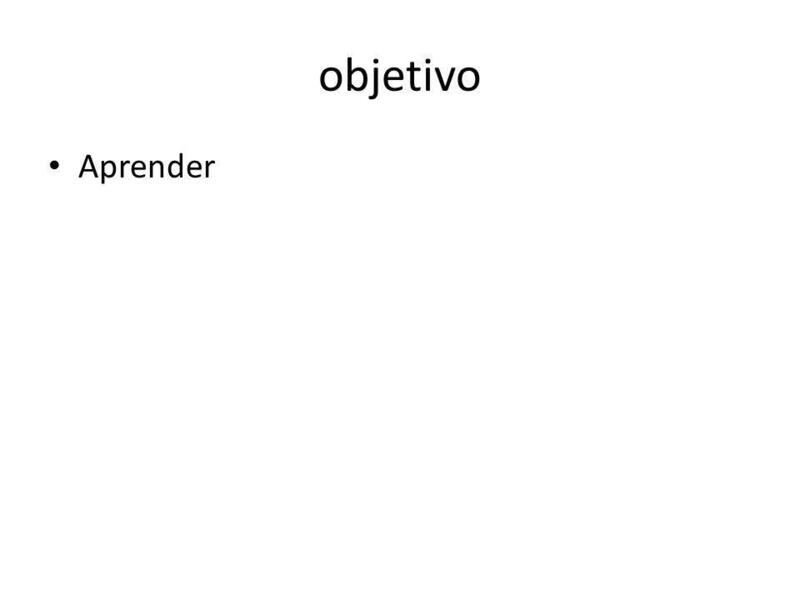 ESPAÑOL II Verbs Followed by Infinitives. 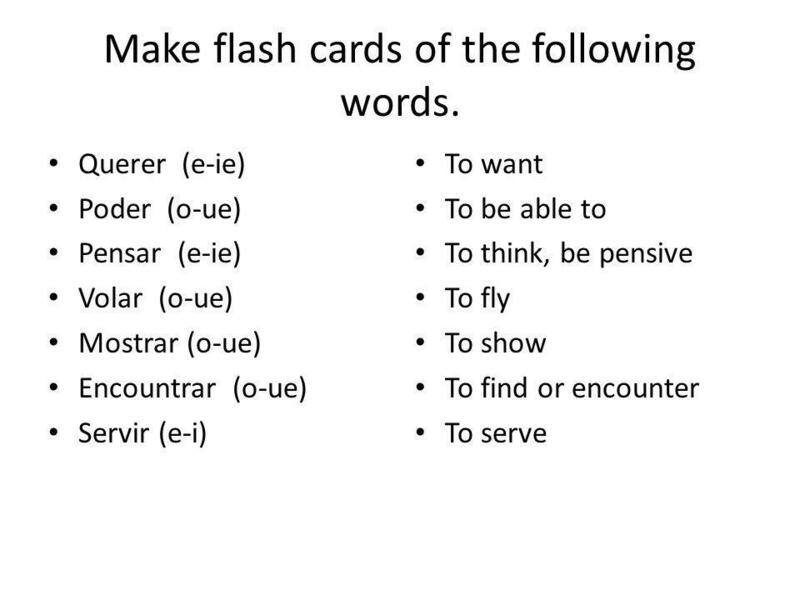 Most of the time, when you use a verb you will need to conjugate it. Ejemplo:  Juana lava los platos.  Luis.